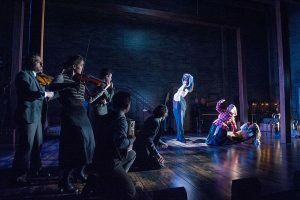 After a two-minute dance break, featuring almost every actor in the cast engaging in an array of wildly complex, yet precise tap routines, the dancers triumphantly returned to singing the musical’s title song amidst thunderous applause. As they all surrounded the rotating staircase in the middle of the stage, Soara-Joye Ross, playing the show’s female protagonist Reno Sweeney, belted out the song’s final words, “anything goes,” and the overwhelming sense of wall-to-wall energy in the Fichandler Stage seemed almost tangible. An enthusiastic and animated rendition of a beloved classic, the phenomenal cast of Arena Stage’s production of Anything Goes had the audience giving a standing ovation before the end of the first act. 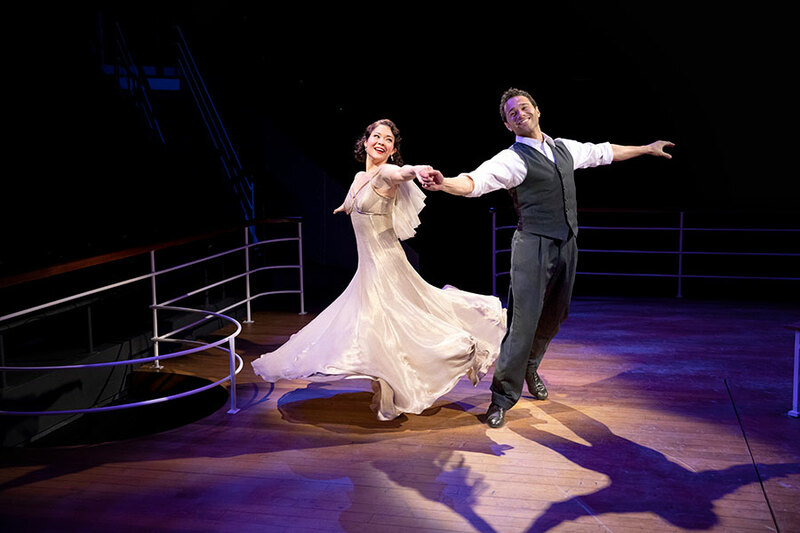 Set during the early 1930s, Anything Goes shows young broker Billy Crocker (Corbin Bleu) as he spontaneously follows his already-engaged heiress love interest, Hope Harcourt (Lisa Helmi Johanson), aboard the S.S. American. Also making the journey is Billy’s friend and casual admirer, nightclub singer Reno Sweeney (Soara-Joye Ross). Billy needs to hide from his boss, Elisha Whitney (Thomas Adrian Simpson), whilst aboard the ship and ends up assuming the role of the gangster “Snake Eyes,” deemed Public Enemy #1, with the help of actual gangster Moonface Martin (Stephen DeRosa), who is Public Enemy #13. Running through Dec. 23, Arena Stage’s production of Anything Goes stays true to the show’s original intent by enchanting the audience from beginning to end with two hours and forty five minutes of pure joy. As the title suggests, the musical comedy features a fun plot full of dramatic irony, miscommunication, and general antics, keeping the audience intrigued while Cole Porter’s masterful score is effectively given the central focus. Ultimately, boy gets girl, boy loses girl, boy gets girl again. However, this does not happen before Billy befriends a gangster, becomes celebrated as the public menace he is pretending to be, and then gets thrown in the brig. Reno attempts to seduce Hope’s naive English fiance and instead just adds “hot pants” to the fiance’s list of American idioms that he insists on enthusiastically using incorrectly. Billy’s boss, Elisha Whitney, unsuccessfully pursues Hope’s mother, Evangeline, whilst stumbling around for hours after Moonface Martin steals his glasses. 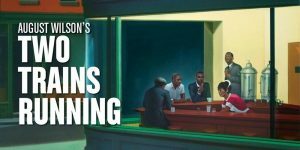 As these hilarious scenarios suggest, much of the plot is meant to simply make the audience laugh while providing context for as many Cole Porter songs as possible. This makes for the kind of immersive and enjoyable experience that DeRosa says is inherently intended as a political action. With a focus on the strength of friendship, be it with an evangelizing nightclub singer or an optimistic gangster, the musical leaves the audience with a wholesome ending in regards to each character’s pursuit of happiness. The main cast features an array of diverse and talented actors. Corbin Bleu shines onstage as Billy Crocker, proving that he has outgrown his teenaged stardom and become a show business professional. 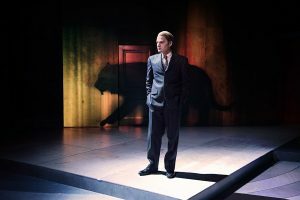 A true triple-threat, Bleu’s expert tap dancing, beautiful singing ability, and entirely earnest portrayal breathes new life into Billy Crocker’s wistful persona. Lisa Helmi Johanson does an excellent job playing a Hope Harcourt that is less helpless than the character is often portrayed as being, but still a bright-eyed, prim and proper foil to Reno. DeRosa’s incredible comedic ability comes through in his portrayal of the softer side of a washed-up gangster. His rendition of Moonface Martin’s signature number, “Be Like the Bluebird,” was met with uproarious laughter. In addition to DeRosa, the show had no shortage of comedic prowess. Moonface Martin’s partner in crime, Erma (Maria Rizzo), enchants in the raunchy “Buddie, Beware.” Jimmy Ray Bennett, who plays Hope’s stuffy English fiance Lord Evelyn Oakleigh, manages to make his character surprisingly likeable by using perfect comedic timing to convey the character’s naivety. Lisa Tejero and Thomas Adrian Simpson, who play Hope’s mother and Billy’s boss respectively, delight as often-times oblivious authority figures. Ultimately, Soara-Joye Ross stole the show. Her vivacious performance as protagonist Reno Sweeney radiated an unabashed sense of confidence and charisma. Her incredible stage presence made it almost impossible for anyone to take their eyes off of her. She instantly added dimension to every scene and, especially, every musical number. Her playful song with DeRosa, “Friendship,” featured exaggerated swing moves and an extended fourth wall break that only worked because of the happy go-lucky energy the two created. In Reno’s staple duet with Billy called “You’re the Top,” Ross and and Bleu work together magnificently by matching charisma in a joyful give-and-take that ultimately makes for one of the most phenomenal numbers in the entire show. It was little surprise, once the spotlight shone on Ross as she began belting out the opening lyrics to the song Anything Goes, that the musical’s title number would close out the first act with a standing ovation. Even though it was written in the 1930s about the 1930s, Anything Goes is still extremely enjoyable today and Arena Stage’s production features some much-needed modernizing changes, starting with its diverse cast. There is a scene towards the end in which certain characters pretend to be Chinese by doing stereotypical accents. The production turns this into a joke about the ignorance of those who actually believe this ruse by incorporating the knowing support of characters who are actually Chinese and have easily tricked uncultured people before. The final line of the iconic chorus to the musical’s title song, sung by Reno, is originally, “And though I’m not a great romancer, I know that you’re bound to answer when I propose / Anything goes.” In the 1930s, the idea of a woman proposing to a man was so outlandish that it perfectly personified the idea of “anything goes.” Now, Ross sings, “I know that I’m bound to answer when you propose,” pointing at one of the female swings. These subtle changes, while certainly not outlandish, successfully reflect modern societal values while still keeping true to the original show. Ultimately, the sense of joy that Anything Goes conveys will always be timeless. This rendition’s wonderful cast breathes new life and hilarity into show’s book, while doing more than justice to Cole Porter’s iconic score. By accomplishing this nearly impossible feat, Arena Stage’s production is an absolute success.